The theme for this years St Thomas USVI Carnival is “The Biggest Fete Ever Seen, Carnival 2014"
St Croix, the largest of the USVI island, celebrates carnival in December and January. St Thomas is gearing up for their carnival celebration in April and May, and the smallest island St John hosts their carnival in June and July. 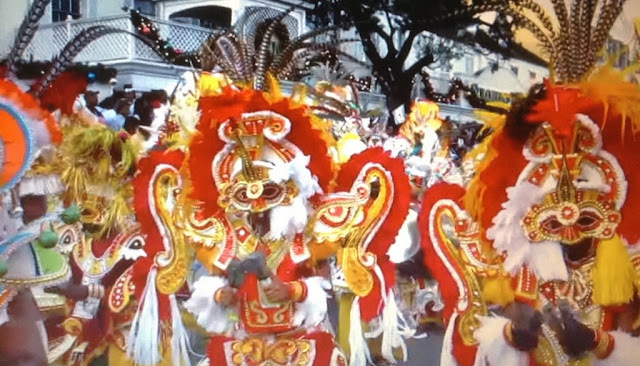 The month long pageantry on St Thomas includes dancing, singing, parades, masquerades, calypso & steel pan musical bands, queen pageants, live entertainment, local food/drinks and crafts. April Carnival Events: Princess Show, Queen Selection Show, Toddlers Derby, Carnival at the Schneider, Jr Calypso Competition, Cultural Night, King & Queen of the Band, Calypso Competition, Carnival Village Opening, Calypso Revue, Steelband Jamboree, Water Sports Activities, Pre-Teen Tramp, and Senior Citizen's Quelbe Tramp. Wednesday, April 30th The Cultural Food & Crafts Fair showcases the islands local cuisine, produce and plants. Local vendors will have arts and craft for sale, along with live entertainment. Thursday, May 1st The early morning jump up party J'ouvert starts at 4:00 a.m. with marching bands leading the way through the streets with party goers dancing along, while others stand on the side lines and cheering their favorite bands. Friday, May 2nd is the Children's Carnival Parade showcasing every age group from toddlers to teens performing along the main Carnival route in colorful costumes. Saturday, May 3rd is the Adult Carnival Parade which takes place in Charlotte Amalie along Main Street featuring thousands of participants including hundreds of masqueraders in elaborate costumes, stilt walkers (mocko jumbies), carnival royalty, and musical bands. The parade kicks off at 10:00 a.m. and lasts for 7-8 hours.